Careful, they may be addictive! 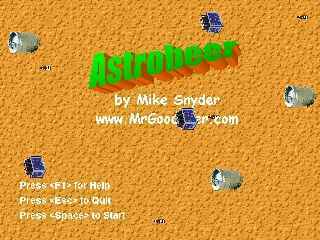 Based on the classic game "Astroids". 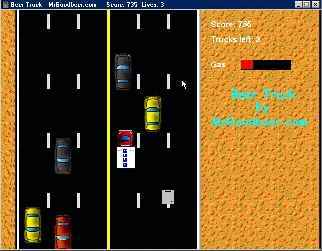 Pilot your rocket powered beer truck through a sea of beer while eliminating kegs, six-packs, bottles, and cops throwing donuts! 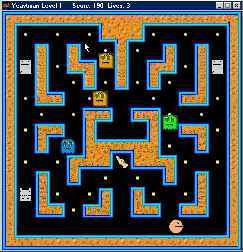 A traditional game like pacman. The goal of this game is to get all the sweet wort (dots) by eating them with your yeast cells (pacman). Bad bacteria try to eat you so you should avoid them. The kegs of beer will help you. When you eat a keg the bacteria temporarily become afraid and can be chased for points. Also sometimes a bonus beer bottle appears. Get the highest score and don't be eaten. If the bacteria take over the yeast cells, the beer is ruined! As Seen On . . . . . . The July 10, 2002 episode of TechTV's (now G4techTV) "The Screen Savers" (now "Attack of the Show") featured Beer Truck in Martin Sargent's "Twisted List: Top Five Free Arcade Games" (full story here). Martin Sargent had his own show on TechTV titled "Unscrewed"
If you like our games, buy us a beer, six-pack, case, or keg (in your currency) by clicking the donate button. Or buy some Mr. Goodbeer Gear instead! Thanks & Cheers! Feel free to list them at your site. If you do, let us know and we'll link back to you!